Description: Digitization provided by the USF Libraries Digitization Center. Rare Maps. 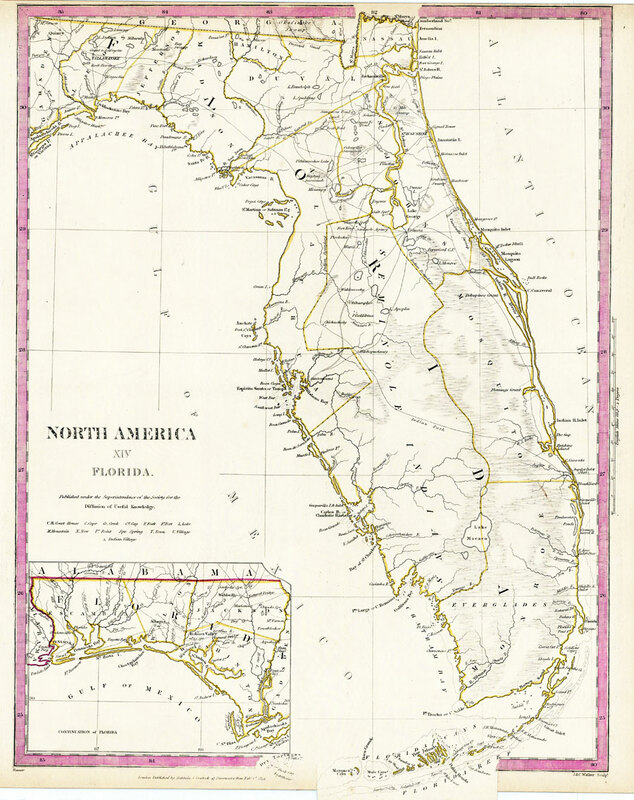 This is a hand colored map of Florida, circa 1834. This map shows cities and towns, inland waters and an inset map titled "Continuation of Florida." This map shows Florida with only 15 counties and a large area of the central peninsula as Seminole Indian lands. A trail is shown marking the Indian route across the southern peninsula north of Lake Okeechobee as well as the location of the Seminole Agency near Fort King. Lake Okeechobee is referred to as Lake Macaco and many of the rivers have names different from those used today. A proposed cross-Florida canal is shown running from the St. Marys River to the Santa Fe and Suwannee rivers and a second proposed canal running from the St. Marys River to Apalachicola Bay. Measurements.Dimensions: 41 x 33 cm. Measurements.Resolution: Scale [ca. 1:1,774,080].